Twisted burlap jute string approximately 1/32" diameter from May Arts. Use this ruby red color not only for Valentine's Day and Christmas, but for all general crafts, decor and packaging. 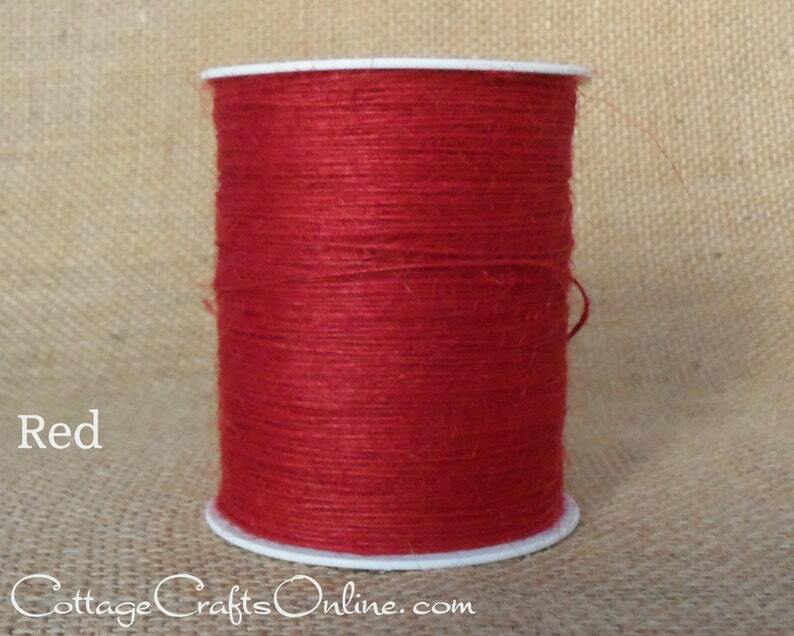 Makes a great thread for edging handsewn crafts and felted items. Contact us for a sample if needed. This listing is for a 400 yard roll of red. RETURN POLICY: Please choose carefully and review our Shop Policies for details on limitations, restocking fees and procedures for returns. SHIPPING: If you are purchasing more than one item on one order, items will automatically combine for shipping. IN A HURRY?? Choose the USPS PRIORITY UPGRADE: This cost is added to the regular shipping cost. Please INCLUDE A PHONE NUMBER so we can reach you at in case of a problem with your order. INTERNATIONAL ORDERS: See our Shop Policies for important information before ordering. THANK YOU for viewing our item! Visit our store for over 1400 ribbons and craft supplies: http://www.etsy.com/shop/cottagecraftsonline. Thank you, just what I needed!